Cloud technology evangelist Chris and serial entrepreneur Billy have just launched Appdopt, coming soon to a business near you. Their mission is to get companies to actually use the tech they’re paying for, by helping users become Outlook aficionados, PowerPoint pros, Mail maestros and Google gurus. The London twosome met when Chris started as a temp at Billy’s company, selling technology systems to corporate firms. Billy found himself drawn to Chris by a shared passion for tech and “that hair”. We caught up to talk about how they got to where they are today – and where they’re headed next. Were you always destined to work in tech, do you think? Chris: I wanted to be a fossil hunter – I used to collect old bits and bobs on the Jurassic coast. But when you’ve been sat in a trench for three months in the rain and the most exciting thing you’ve found is a shard of pot, it can lose its charm. Billy: My only clear memory is wanting to be a mechanic when I was 16. I bought a Mini 1000 for 250 quid, thanks to extensive paper rounds and some help from my dad and did it up. But my dad said I could do that or get a proper job. Chris: It’s very cool to join a tech startup now. We timed it well. Where did the idea for Appdopt come from? Chris: Working at our previous company, we were implementing new technologies for companies. We’d set them up, have a friendly conversation, and wave goodbye. But we found that we were getting a phone call after a few months, saying that the tech worked perfectly but no one was actually using it. Billy: Their frustration was along the lines of “We’ve paid for this, so how do we get people to use it?” They’d ask us to come in and give an ‘adoption’ workshop and we’d wing it completely, scribbling an agenda on a fag packet on the way over. So we had a sensible conversation about how we could do that better. What inspired you to take the leap and launch your startup? Billy: It’s my fourth company, but this time it was scarier than ever. I’ve never developed a product before. But I’ve got a lot of time and respect for the person I’m working with. It was hard to leave a highly-paid salary and a board-level position, but you’ve got to weigh up where you’re at in your career. And the thrill of it is like a drug. It’s moreish. Where did you go from there? Chris: We wanted to create a B2B product that would help businesses get more value from what they’d already invested in. With the tech space moving towards cloud computing, changes in technology are happening more quickly, meaning that learning how to use tech really needs to be ongoing. We want to help companies deal with that. We’ve spent six to eight months working on the app. Billy: We don’t see much of our friends or loved ones anymore. Chris: Not who we were expecting! We did a lot of desk-based research to work out our target market. Our first target is SMEs in professional services or media, but our first client is in healthcare. Billy: Within companies, the people you expect to be well versed in tech often aren’t. You’ve got really competent managers who don’t know how to use spreadsheets. Or millennials, who are supposed to be digital natives, who don’t know how to use tech in a business sense. So, what’s been the biggest learning curve for you so far? Chris: Shifting from tech to the world of HR and learning and development. We’ve really done our research, joining industry groups and attending conferences, as well as taking a course in change management. If you’re entering a new sphere, you’ve got to learn about best practice. Billy: The HR lot are lovely, but they’ve got a completely different language – where we were talking about ‘adoption’, they were saying ‘digital skills gap’. So we’ve spent some time learning and understanding the way they talk about tech. Any fails along the way? Billy: [At first] we overcooked it, trying to get everything done at once. And then when it came to feedback from focus groups, we had great stuff about the content, but had to rethink quite a few things about the delivery. Chris: We’d actually created a 60-page business plan near the beginning which our commercial manager loved. But the business has changed four times since then. I think we should’ve just concentrated on getting the product sorted, before trying to get the all-encompassing business plan out there. Who came up with the great name? Billy: That was Chris. Great hair, great way with words. Chris: ‘Adoption’ comes from our Microsoft background, where it was the buzzword for getting people to use stuff. Then for the first bit we were thinking about what drive technology, which is applications. What kind of company culture are you looking to create? Chris: We’re all about flexibility – not just in name, but actually doing it. Having a central premises as a base is important for client meetings. We’ve fallen in love with ours. But we don’t want to miss out on a hugely talented guy from Spain or Brazil because they can’t commute in. Billy: One of our key developers is a mystery man from Bologna, Italy. We only found out he had a wife a couple of months ago. Chris: We’ve found that with flexible working, a one-size-fits-all approach doesn’t really work. Some people need to see you in person or on video to get a sense of community and trust, while others are happier just getting on with it. Billy: We do have their photos on the wall. We move them around depending on what they’re working on, in some lovehearts. You can find out more about Appdopt at appdopt.com. 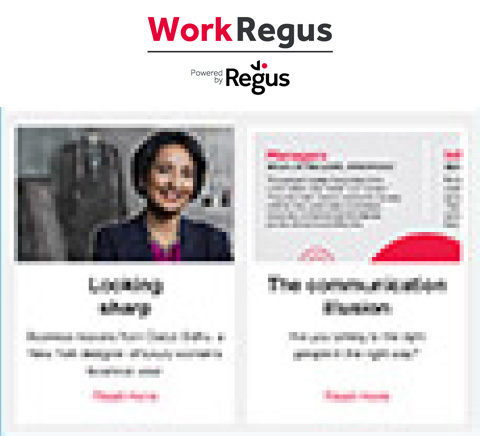 Billy and Chris are based at Regus’ London Bridge office in England.